Finish Rouvy Guide "Lactate threshold improving". Finish Rouvy Guide "Low cadence intervals". Ride Premium route "Monte Zoncolan" in race mode. Ride Premium route "Puerto de Ventana" in the race mode. Ride "Somport (Spain hillside)" in race mode. Collect 2500 points in this level. 1 random draw for a KICKR Core among the chosen finalists who were inducted in this level during the Rouvy Season 18/19 official period. Prizes are not exchangeable for money and to be shipped to the winner(s) by Wahoo Fitness according to standard shipment terms to your country. KICKR Core is the latest in Wahoo's line of smart indoor bike trainers. 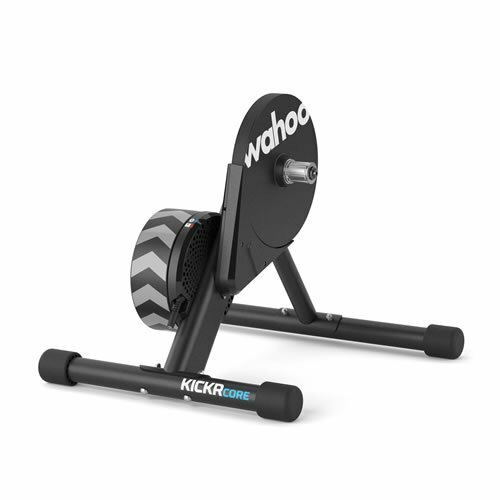 It delivers a realistic, accurate, and quiet indoor training experience by using the proven flywheel technology and advanced algorithms of Wahoo's legendary indoor bike trainers. The KICKR CORE indoor trainer is built with the durability to withstand all of your indoor training sessions and no other brand of smart trainers has more apps and software training options.